The spring 2019 National Organic Standards Board (NOSB) Meeting will be April 24-26 at the Renaissance Seattle Hotel in Seattle, WA. 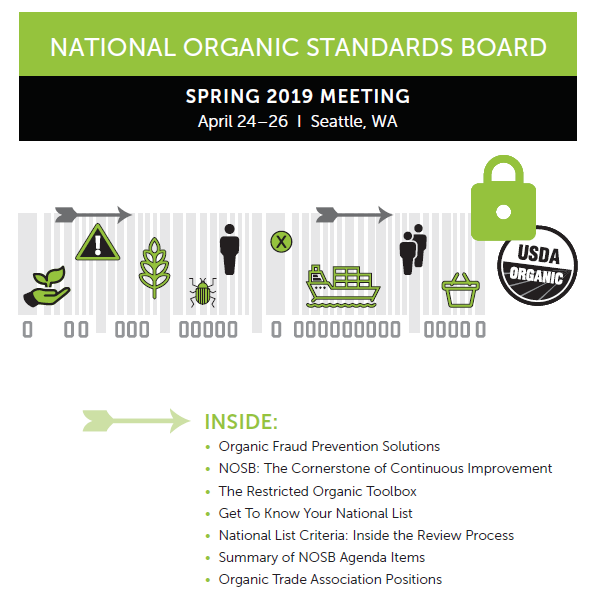 The Organic Trade Association’s complete guide to the Spring 2019 National Organic Standards Board (NOSB) meeting is now available! The Organic Trade Association (OTA) is sharing this booklet with its members to help explain the topics currently under NOSB consideration and to encourage participation in the public process. Track the NOSB votes using the Organic Trade Association’s Voting Tally Sheet! The Meeting Agenda and Meeting Materials (all proposals and discussion documents to be considered at the meeting). The meeting materials have been voted on by subcommittees of the NOSB, and the full Board will discuss and/or vote on the materials at the in-person meeting. Scroll down for links to individual meeting materials along with comments from the Organic Trade Association. The oral comment period will begin with two webinars scheduled on April 16 & 18, 2019, from 1:00 - 4:00 p.m. Eastern. To listen to the webinars, you may dial in by phone (866.740.1260, Access Code 7202000) and/or access it though the web (http://www.readytalk.com, Access Code 7202000). If you forgot to register in advance to give oral comment at the webinars or at the in-person meeting, please email or call Michelle Arsenault, 202-720-0081, to be added to the waitlist. Organic Trade Association staff will be on-site at the meeting in April 24-26 to deliver public comments and report back to members on the meeting discussions and outcomes. Follow OTA’s tweets for a play-by-play report of Board decisions, and stay tuned for an in-depth follow-up publication after the meeting. As listed in the Meeting Agenda, public comments for the in-person meeting are scheduled in the afternoon on the first day (Wednesday, April 24) and into the morning of the second day (Thursday, April 25). The Board hears comments and then discusses Subcommittee proposals and discussion documents. Deferred items and final votes will take place on Friday, April 26, the last day of the meeting. Agenda items may be withdrawn or votes may be postponed at the discretion of the Board. This year (2019), the National Organic Standards Board (NOSB) will vote on whether to continue the allowance of several of the fertilizers, pest control products, livestock treatments, processing aids, and ingredients currently allowed for use by certified organic operations. These National List inputs will be reviewed and voted on by NOSB based on their Sunset timeline (5-year renewal date cycle), and may not be renewed if new information indicates these substances are incompatible with organic production. To help facilitate a robust comment process, OTA has created a survey system for collecting feedback from certified farms and processors. These electronic surveys can be used to submit feedback on each individual input currently under NOSB review. Each survey is CONFIDENTIAL, and contains about 10 short questions that will take an estimated five minutes to complete. The National Organic Standards Board was created through the Organic Foods Production Act, a sub-section of the 1990 Farm Bill. The Board is charged with the task of assisting the Secretary of Agriculture on which substances should be allowed or prohibited in organic farming and processing. The Board also advises the Secretary on other aspects of the organic regulations. This 15-person citizen advisory board brings together volunteers from around the United States. It is made up of four farmers/growers, two handlers/processors, one retailer, one scientist, three consumer/public interest advocates, three environmentalists, and one USDA accredited certifying agent.